But this year I am mindful that Christmas feels different. People are fearful; our country is changing before our eyes. Many are without jobs or have suffered serious cutbacks to their income. And it goes without saying that the faith behind the holy day is definitely under attack. All this makes it very important to me to show others what Christmas is all about. A couple of years ago, PLW and I introduced a new custom into our Christmas observance. First of all, I've shared in the past that part of my journey in this life has been to learn to trust my God for all my provisions; and I do mean all. That includes everything from my self-esteem, to where I live, to how much money our little self-employed business brings in. I've also learned the additional lesson that all I have comes from Him and flows through me to others. 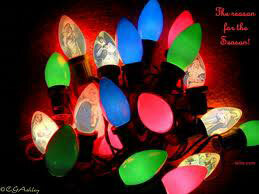 We buy a few Christmas cards and insert cash or a gift card along with a personal, yet anonymous message. We write "Merry Christmas" on the front of each envelope and begin our assignment. We go to a grocery store or a discount shopping center, or just take a walk down a crowded sidewalk. We are alert and watchful, and then it happens. Call it intuition, discernment, a hunch, or, as I prefer to think of it, the Holy Spirit .... but we instinctively know who to give our hope-filled Christmas card to. Sometimes it has been an elderly woman checking every price for the cheapest brand of over-the-counter medicine; occasionally, it is a young family with small children and only a big rubber ball or inexpensive toy truck as their purchases; or a mother in the cereal aisle, obviously trying to stretch every dollar with the meager items in her grocery cart. Somehow, we don't have eyes or hearts for anyone else but that person in front of us. We walk up to them, smile and say, "Merry Christmas!" We hand them the sealed card and walk off. Most everyone is hesitant to take it, but the greeting on the front of the envelope assures them we are not meaning them any harm. Sometimes we see tears welling up in surprised eyes, as they seem to know that we are just the messengers of something greater. We never wait for their response or to see their reaction as they open the envelope and read the card. That's not our purpose. Our goal is to embody the true spirit and meaning of Christmas; to represent the unmerited gift that God gave us in His Son; and to let those who need to hear from Him that He knows their needs and will never forsake them. We just simply walk away in search of the next person that God wants to bless. The amount of money doesn't matter. Race, gender and age aren't in the equation. We don't have a lot to give, but God continues to bless us with all that we need, and more to pass on to others --- as long as they know it's not coming from us, but from Jesus, the real "Reason for the Season", as they say. One year we invited our young nieces to be the "givers of the cards". It was beautiful to see how they opened their hearts and listened to the Spirit to reveal just the right person to bless. I hope it taught them to see past all the hoopla and materialism of Christmas, and actually focus on another human being. I hope it blessed them, as well. I know it has certainly blessed us. This new tradition adds an extra dimension to the meaning of the spirit of Christmas that sending a check to a charity, or supplying a wrapped gift to an anonymous child fails to impart. Don't get me wrong! Those are worthwhile efforts and we continue to do that for others. But this little project inspires us to make contact with our fellow man; to look into their eyes and see the reason God sent His Son, and why we celebrate this holiday. Our message in the card: Our Lord and Savior, Jesus Christ, has sent us with a message of hope this Christmas season. He has provided this money to meet some need you might have. And He wants you to know that He loves you and is able to meet ALL your needs. Ask Him into your heart this Christmas, and He will answer. Merry Christmas! So, I invite you to begin your own tradition this Christmas. There are lots of people hurting, and we can all help someone else face what might be a frightening time in their lives. We can show them that God has not forgotten them nor forsaken them. I'm sure you can expand on our idea and come up with your own unique ways to encounter the true spirit of Christmas. 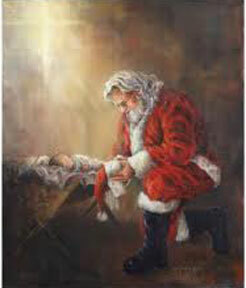 Involve your children or grandchildren and teach them what Christmas is really about. I promise you will receive much more than you give. Matthew 1:22-23 "All this took place to fulfill what the Lord had said through the prophet: 'The virgin will conceive and give birth to a son, and they will call him Immanuel' (which means "God with us")."